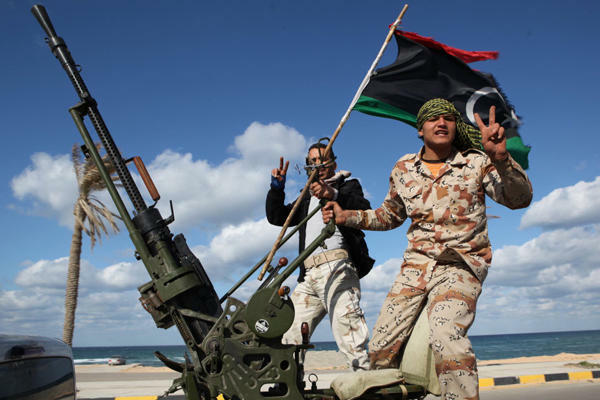 If there is one place in the world best not to have a black face it has to be Libya. This is a country, months after the fall and brutal murder of Colonel Gaddafi, where political power still comes from the barrel of a gun, and the guns in question belong to the numerous militia units. Hundreds of Sub-Saharan Africans have been rounded up and held for months on no authority at all. Why? Simply because they are black and all black people are suspect. Formerly people from Chad, Niger and Mali, countries to the south of Libya, were encouraged to come as a source of cheap labour. Thousands arrived and of these thousands a few hundred were hired by Gaddafi as mercenaries. They were among the last defenders of the regime. Because of this and because - as we all know - it’s impossible to tell one black face from another, all those who could not escape the mayhem of the brave new Libya were automatically assumed to be guilty. They are being held, so the story goes, as ‘illegal immigrants’ awaiting deportation. Deportation, alas, is proving to be a particularly lengthy process. Some people have been kept for months in particularly dire conditions. Martin Fletcher, an associate editor of the Times, journeying through the country, found one such holding centre, a former police training camp, in the Sahara Desert near the town of Gharyan. There, in scorching heat, some 1250 black Africans are living in metal huts with no air conditioning. Fletcher says that they have no contact at all with the outside world. I assume this means that not even representatives of their own governments are allowed to see them. Neglect is one thing, but there is more than simple neglect here. Many of the men, held in makeshift camps across Libya, have also been tortured, according to one western human rights official. 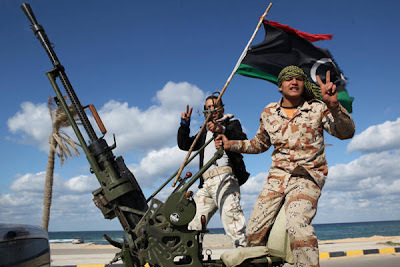 Libya has a kind of government, if you can call it that, presiding over the anarchy, a particularly delicious oxymoron. It calls itself the National Transitional Council. So far as it is concerned there is no wrong done in the name of right. It recently approved a law extending immunity for actions taken in ‘defence of the revolution’, just the kind of blank cheque the militia gangsters need. Actually they probably don’t, but it’s there all the same. The ‘defence of the revolution’, incidentally, embraced the destruction of Mushashya. This once prosperous community has been turned into a ghost town, inhabited only by scavenging cats and dogs. Fletcher discovered that all of its 8000 inhabitants, men, women and children, had been driven out, denounced as “Gaddafi’s dogs.” He neglects to say where these ‘dogs’ are now. I’m guessing he simply does not know. Does anyone, I wonder? Islam has been rocking the 7th Century for 1400 years - nowhere more so than North Africa. That's no recipe for progress of any kind. It's entire effort is devoted to keeping the Dark Ages dark: any time a mullah spots a ray of light, he's ready to extinguish it. Brute force from the West put paid to overt expression of some of their nastier habits - piracy, slavery - but some of their other vile practices still cling tenaciously to the mores of the last millennium but one. 19th Century gentlefolk had less difficulty knowing how to treat with alien cultures. Old School Europeans didn't blame Africans of any shade for their savage lack of morals and manners, they just accepted them as inferior and set about dutifully beating some semblance of civilization into them. Oddly enough, it worked . . . which is, naturally, why it is totally unacceptable today. Totally. :-) Keep an eye on Egypt and Syria, Calvin, particularly the latter. There is a lot of misinformation in the media. The Beeb in particular is atrocious, determined to see the matter in black and white. Their style of reporting now is beyond disgraceful. Great post - I loved the Chesterton killer quote! That's a super article, Calvin. I may add my own gloss. Many thanks. The Dogs of war are in "time out", there are at times serious consequences for picking the wrong side in a conflict. The thing is the majority of these people did not even take sides; they were just there. How Many Camels is Obama Worth?